The jewelry world is filled with endless choices, and we know just how frustrating it can be when experts throw around terms you may not understand. Whether you’re shopping for yourself or your groom, knowing a little bit about the common ring metals and materials can help make your decision a little easier. We took the liberty of compiling several of the most popular metals and ring materials so you can easily determine their similarities and differences to make the best decision. Each ring metal or material offers its own unique set of benefits. We divided the materials into two key classifications: precious and alternative metals. 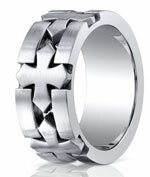 In recent years, alternative metals have grown in popularity due to their unique appearances. We collected a few tips for you to keep in mind while browsing and making your final decision. For hundreds of years, there were only a few ring materials a man could choose from: gold and silver. Rose gold only started becoming popular in Russia toward the beginning of the 19th century, but white and yellow gold have been two of the most coveted jewelry metals in history. The precious metal family includes the only naturally occurring yellow metal in existence as well as silver and platinum. Precious metals are the traditional choice for wedding bands, engagement rings, or heirloom jewelry. Remember that precious metals are medium to heavy compared to alternative metals. Depending on the carat or plating you choose, a ring made of precious metal will also be less resistant to scratches and tarnishes than alternative metals due to their purity. 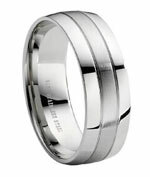 Although gold is available in several sophisticated hues, platinum and silver are rather limited to silver and white. Alternative metals may offer a wider variety of colors for you to choose from. What began as a simple trend grew into a full-on fashion statement. Alternative metals are here to stay, and modern couples aren’t shying away from the challenge of deciding which is better suited to their lifestyles and expectations. The alternative metal group comprises tungsten, titanium, stainless steel, cobalt, palladium, and more. While precious metals are regarded for their timelessness and value, alternative metals are available in a gamut of colors and jewelry textures. Titanium, palladium, cobalt chrome, and stainless steel are each lightweight and might make the perfect choice for anyone who isn’t accustomed to wearing rings. Tungsten is a heavy alternative metal that’s as tough as steel, and it also resists scratches, corrosion, and discoloration better than other industrial metals. 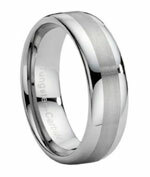 Experts rate tungsten as one of the most durable metals available on the market. Strength or alternative beauty often comes with their own set of sacrifices. Before deciding on the alternative metal of your dreams, remember to check whether the material can be resized or cut off the finger in the event of an emergency. Alternative metals aren’t the only novices to take the fashion world by storm. Although clay dates to at least 24,000 B.C., ceramic rings are more popular than ever. Ceramic jewelry styles are often available in a rich jet-black hue that’s a unique yet versatile alternative to standard metals. Seranite is a ceramic-based material that is durable and provides long-lasting wear with a black luster to adore. Tantalum is a chemical element that is classified as a transition metal and is lustrous as well as highly resistant to corrosion. 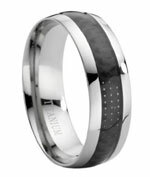 In an effort to help our customers find the perfect wedding band or fashion ring, we have created a number of information pages about each of the ring metals and materials we offer. Each page serves as a quick reference guide to each material. Learn more about wedding bands, pendants, necklaces, and bracelets by exploring our inventory today. If you have any questions, please contact a member of the JustMensRings.com team for further assistance. Who Gets Silicone Wedding Rings?